Austerity Measures In Cuba Spark Fears Of A Return To Dark Economic Times : Parallels Since July, authorities have cut work hours, electricity and gas supplies. Those measures have prompted fears of a return to austere economic times. Meanwhile, Venezuela has cut subsidies to Cuba. 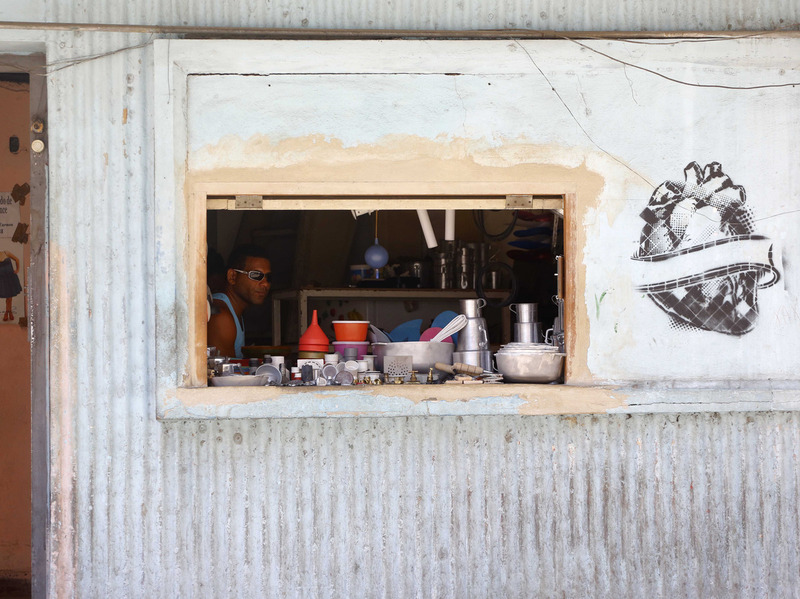 A private entrepreneur who sells house and kitchen supplies waits for customers in May at his home in Havana. Austerity measures in Cuba and a drop in subsidized fuel from Venezuela are hampering the economy. Cubans are bracing for a tough end of the year, after what has already been a rough summer. The island's economy is in trouble. Venezuela, Cuba's main patron and supplier of cheap oil, has slashed its generous subsidies, while Cuba's other top cash commodities are facing worldwide price plunges. Since the U.S. and Cuba improved relations and President Obama made his historic trip to the island in March, expectations had been running high among Cubans that better economic times were coming. But beginning in July, authorities cut work hours and electricity and gas supplies. 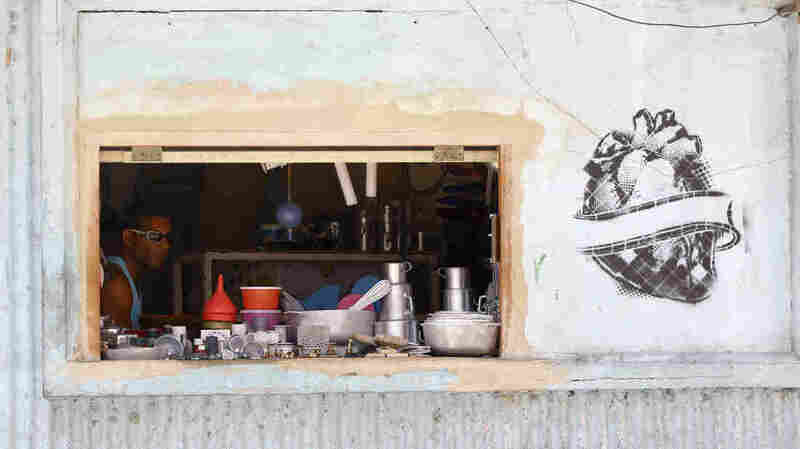 Those measures have prompted fears of a return to austere times in the 1990s after the collapse of the Soviet Union, known as the Special Period, when many older Cubans remember cooking with charcoal, going long periods without electricity and having a hard time finding food. Cuban officials won't give hard figures, but some estimates say as much as 40 percent of the oil supplied by Venezuela has been cut. That's put quite a strain on Cuba's rough-and-tumble transportation system, which consists of a limited number of public buses — always stuffed to the gills — and a pack of privately run taxis. 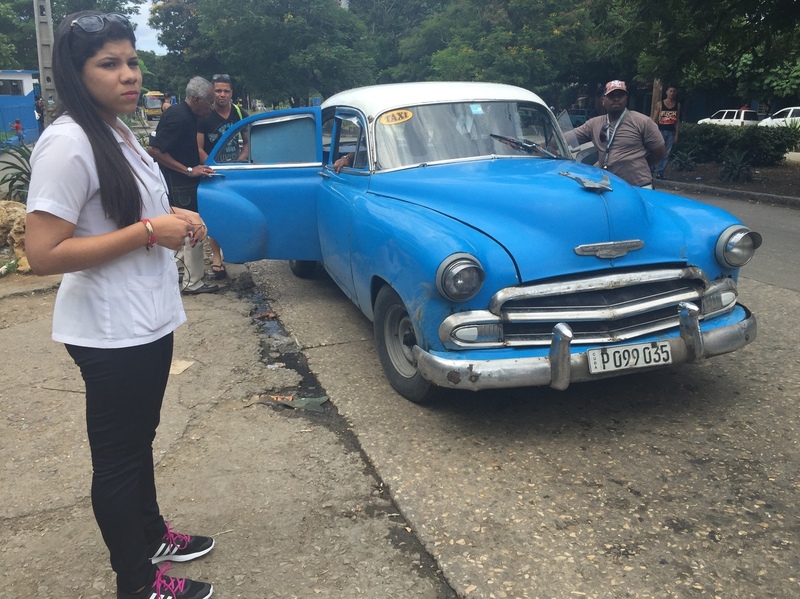 Fewer taxis are on the road since Cuba's austerity measures took effect this summer. Medical student Claudia Arango waits at a transfer stop. These aren't the polished, prim, 1950-era classics seen driving past Havana's waterfront: These taxi cars are barely held together, and packed with six people. At a main transfer stop in midtown Havana, passengers jump in and out of taxis. But not medical student Claudia Arango, 20, who was trying to get across town to her shift at a clinic. "I've been here 10 minutes already and not one taxi going that way has come by," she says. Ever since the austerity measures took effect this summer, there are fewer taxis on the road. Roy Ramirez, 31, says it's tough filling up his beat-up '57 Chevy taxi. "To run a car this big I need 40 liters of gas a day," he says, or more than 10 gallons. At the official state-run gas stations, that costs Ramirez about $45. Most of the drivers avoid that by buying fuel off the black market for about half that much, but as supplies have shrunk, those prices have nearly reached the official ones. Taxi fares are set by the state, and any unauthorized rides can result in big fines, confiscation of vehicles, even jail time. Drivers say the pricier fuel has slashed their wages by as much as 30 percent, and many have just opted to pull their cars off the road. On top of the transportation woes, authorities have cut office hours in some state industries and turned electricity off. Authorities say they will do their best to minimize electricity cuts to residential areas or the booming tourist hotels and restaurants. More than 3 million tourists — including many now from the United States — hit Cuban shores last year, but that surge hasn't been able to offset shortfalls in other cash-generating exports, including nickel and sugar. Peering into the window of a state-run shop selling small kitchen appliances, Adriana Norman says all the electronics are too expensive for her meager monthly salary. The 39-year-old, who was a teenager during the Special Period, says sometimes, with the lack of buses and blackouts, "it feels like we're back there again — but it's not as bad. Hopefully it won't come to that again." Richard Feinberg, an economics professor at the University of California, San Diego, says Cuba has far more economic partners than it did in the 1990s, when Cuba relied solely on the Soviet Union, "but they haven't succeeded in diversifying their export offerings." "Therefore they remain without the ability to earn foreign exchange, and they continue to need to import almost everything," he says. Feinberg, author of Open for Business: Building The New Cuban Economy, says the Castro government has slowed plans for opening to foreign investment and reforming key industries. Cuban leader Raul Castro shrugs off speculation of an imminent collapse of the economy. In a speech to a closed session of Parliament this summer, Castro said there was no denying there would be ill effects, but in remarks published in state media, he said Cuba is better off today. Cuban officials do warn that the second half of the year is shaping up to be even tougher, as they expect further drops in export income and fuel supplies. Laura, a state worker who didn't want to give her name because she was not authorized to speak to the press, says she is praying that isn't true. She says so far the power cuts haven't been too bad — only about two hours a day. The worst part is battling to get to work in taxis and packed public buses in the cruel Caribbean heat. "And you get to your office thinking at least there is air conditioning, but then find out it's been shut off," she says. "It's a big psychological blow."